Anyone who has ever endured a long flight knows how hard it is on the body. Several years ago, I took an 11 hour flight to Paris from San Francisco. In the cramped space of the plane there seemed to be nothing to do but sit, with an occasional jaunt to the restroom. My new best friend (the man in the seat next to me) and we ended up resting our heads on each other to sleep. Perhaps, because I fly quite often, friends have made it a point to tell me about people who spend hours on a plane only to drop dead of a blood clot in the terminal. As with all sedentary lifestyles, blood tends to pool in your legs. Blood returning to the heart has to work against gravity to move up the legs. When we are moving about, the muscles massage the veins, helping them push the blood. When we are sitting, veins work alone, blood moves slowly, and clots form. When we get up and race to our next gate, the clot is carried through the vein to the heart or the brain. Sitting still on an airplane for long periods of time is more than not healthy. It is downright dangerous. As for me, a recent bone scan proved what I feared. I have osteoporosis. I am enrolled in a balance and bone building exercise class. Unfortunately, because of my travels, I have missed a lot of class time. And, in June, I am planning another long flight to France. How could I incorporate exercise into my travels? Since I have a tendency toward twitchiness, I always use early arrival time and lay over time to walk up and down the airport terminal. My pace, towing a carry-on and a backpack of food and art supplies, is about three miles an hour. The shoeshine man in Dallas-Fort Worth watched me coming and going and finally said, “Man, are you still here?” We both laughed. I guess I am a spectacle. It became a challenge to adapt exercises so that they could be done in a cramped airline seat without totally annoying seat mates. The first consideration was equipment. No one wants to haul barbells in their carry-on. Most exercises can be done without any special equipment. 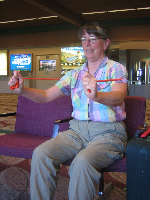 A few use an exercise band which can be found at sporting goods stores for about $5.00, and can be carried in a pocket. For a real aerobic workout, a small music player loaded with your favorite rhythms and head phones can be used to “dance” the exercises. Just remember how much space you have and be considerate. During the down time in a terminal, you can always find an empty gate and be a bit more aggressive with the routines. And, at Lambright’s insistence, get out of your seat at least once every hour. Stand up and stretch, walk up and down the aisle, go to the bathroom, do heel drops. Hold a seat back if you need to, stand on your toes, then drop heavily to your heels. You can even do a few squats in the aisle. Go down, keeping the lower leg as straight as possible, and come up onto the toes. If you are worried about what everyone thinks, don’t. You will never see them again. It is difficult to get an aerobic workout in an airplane, so walk whenever you have layover time. Start slow to warm up. A brisk half an hour to 45 minutes can mount up to several miles. 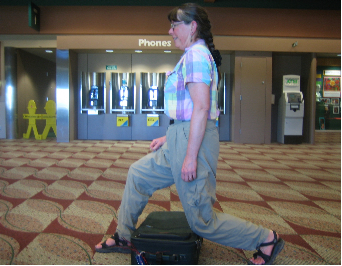 While waiting for the ticket agent, security, or your lunch, raise up on your toes and drop onto your heels. Stand on one foot, raise the other one as high as you can. Before you begin any new exercise program, have a check up and get the approval of your doctor. Have fun and fly healthy. Tricep curls: (the small muscle on the back of your upper arm) drape the exercise band over the left shoulder, right arm goes behind your back to hold the lower end of the band, left arm bends close to the left ear and holds the upper end of the band, only moving the forearm (elbow to wrist, pull the band up, hold, release, repeat 10 times, switch arms. Shoulder rolls: raise shoulders to ears, make large circles forward, 10 repetitions, reverse circles, 10 repetitions; variation: put right finger tips onto right shoulder, make big circles with right elbow, switch arms.